At All New Stamping, our customers enjoy the security that comes with knowing there is a high standard applied to the complete development of their parts. From design evaluation to special packaging, our wide range of finishing and assembly services offer our customers options they won’t find anywhere else. All our finishing and assembly work is done with the same attention to detail, follow-through and efficiency we apply to every product we manufacture. Whether spot welding or inserting hardware, we are here to serve your production needs. We know that secondary operations are crucial to our customers so we maintain a host of equipment to provide the additional services you require. 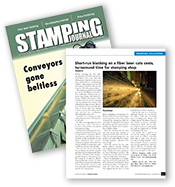 All New Stamping remains at the forefront of the industry by offering peace of mind--or what we like to call Power Satisfaction--year after year to our valued customers. For a detailed quote on any of our services, please contact one of our experienced sales representatives today. about Metal Stamping Secondary Operations?